Simple Hack for Neat & Tidy Stuffed Animal Storage! Super simple storage solution for organizing stuffed animals! I might be able to overlook the fact that I can’t see the bedroom floor. I might even be able to forgive Grandma for buying yet another stuffed bear (cuz they are pretty cute!). But, I absolutely cannot ignore the fact that the stuffed animals have nearly pushed my 8 year old out of his bed. They may be cute and cuddly, but this is war! I’ve tried a million different ideas for organizing stuffed animals and storing them neatly. I used to rotate them out, using plastic tubs with lids stacked in the garage or basement. Inevitably, those little rascals managed to sneak out of their tubs and strew themselves across the house again! I tried the lovely “Pet Net” (aka Toy Hammock) hanging in the corner of the room, but with wall-to-wall bunk beds, it’s hard to find neutral territory. And then I won a giveaway. 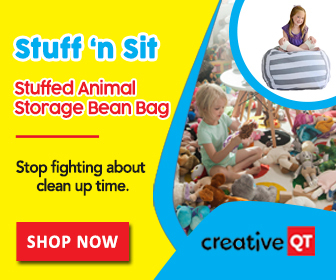 Bean Bag Stuffed Animal Storage? I won an Instagram giveaway from Creative QT. It was for an XL stuffed animal storage “bean bag”. Now, I must admit, I was pretty sure my kids were going to HATE the idea of zipping their stuffed animals into a canvas bag and then sitting on it, so when the Stuff ‘n Sit arrived, I shoved it into the linen closet. But then I saw a video interview with the creators of the Stuff ‘n Sit (a mom and dad with a larger-than-average family living in Kansas City). They shared a video they made showing a floor full of stuffed animals being quickly cleaned up by piling them all into a bean bag – the bean bag I owned! As I glanced across the room at the disorganized, chaotic crowd of stuffed animals taking up valuable floor space, I decided it was worth a shot! I pulled my Instagram prize out of the closet and announced to my children the animals were going in the bag! The kids did indeed put up a bit of a fuss, but I didn’t let it deter me. I was on a mission and didn’t have time to be sympathetic toward stuffed animals. Even my 8 year old’s claims that the Army bears would be disgraced and my 5 year old’s staunch belief that I was hurting his stuffed dog’s feelings did not dissuade me! I was committed to seeing if this crazy bean bag stuffed animal storage thing would work! GO HERE TO SHOP ALL THE COLORS & SIZES! Shockingly, the XL was too big for the number of stuffed animals we own (shhh…don’t tell Grandma there’s room for more!). Organizing Stuffed Animals is Easy! Now that the stuffed animals have a home, tidy up time is a snap! One kid holds the bag open while the others throw them in. It’s even become a game! We don’t put any vinyl 18″ type dolls in the bag because we don’t want them squashed (and who really wants to sit on hard plastic doll feet anyway?!). But everything else, including doll clothes, go in the Stuff ‘n Sit! My kids don’t often sit on the bean bag, but that’s fine by me. I’m just happy the stuffed animals won’t be taking over bedroom floors or kicking little boys out of bed anymore! This would be perfect in my livingroom!!! We are a family of 11 !!!! We have a vintage wooden box holding the blankets but this would be a much more functional!! I bought one of these as a family Christmas gift based on your recommendation. Wow!!!! We had two laundry hampers FULL of stuffed animals and they all fit in the extra large with room for several throw blankets. My kiddos LOVE to sit on it and it looks adorable in my living room. I stuffed the throw blankets near the top where the kids sit so that it would be more comfy. It worked! Thank you so much!! !